Once the module is set up for Master mode of operation and enabled, data to be transmitted is written to the SPIxBUF register. 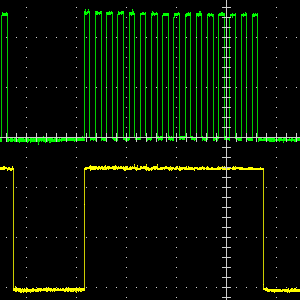 The SPITBF (SPIxSTAT<1>) bit is set. 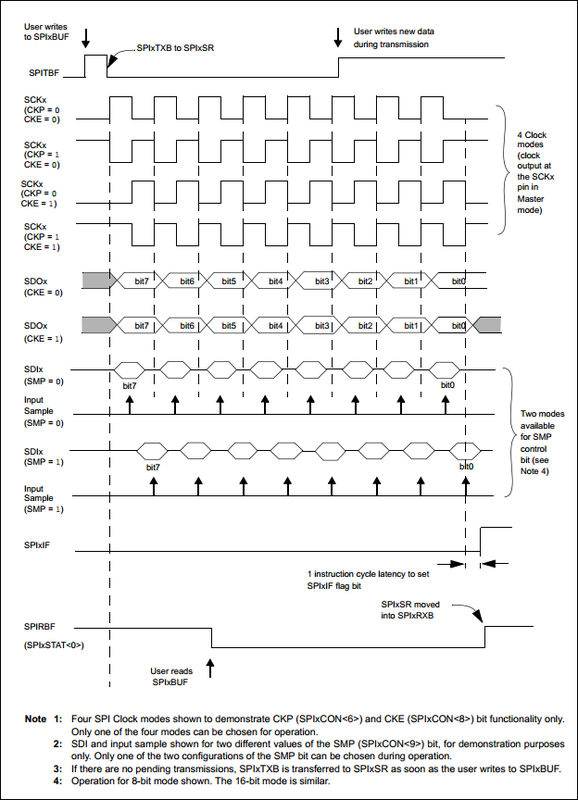 The contents of SPIxTXB are moved to the shift register, SPIxSR, and the SPITBF bit is cleared by the module. 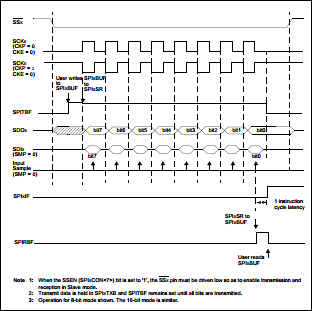 A series of 8/16 clock pulses shifts out 8/16 bits of transmit data from the SPIxSR to the SDOx pin and simultaneously shifts in the data at the SDIx pin into the SPIxSR. The interrupt flag bit, SPIxIF, is set. 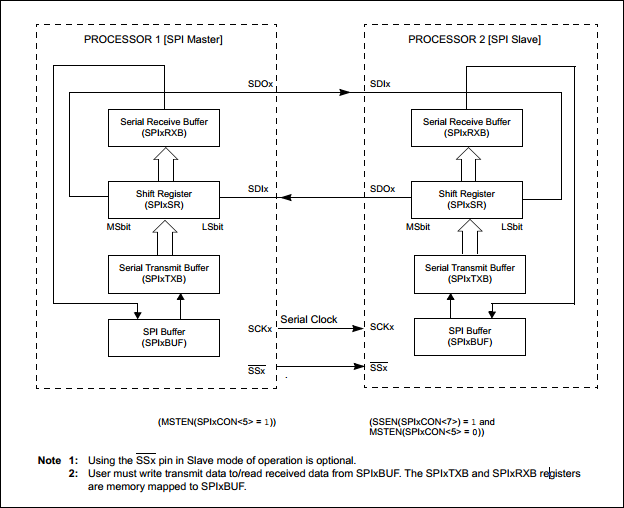 SPI interrupts can be enabled by setting the interrupt enable bit SPIxIE. The SPIxIF flagis not cleared automatically by the hardware. Also, when the ongoing transmit and receive operation is completed, the contents of the SPIxSR are moved to the SPIxRXB register. 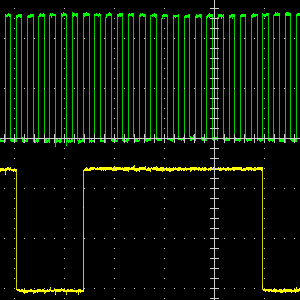 The SPIRBF (SPIxSTAT<0>) bit is set by the module, indicating that the receive buffer is full. 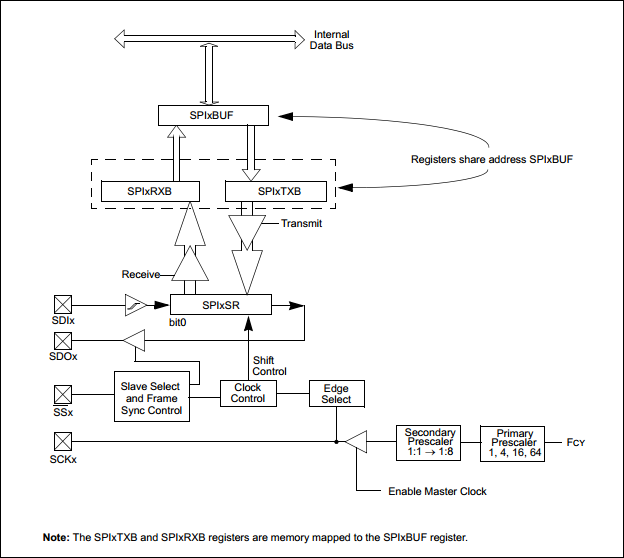 Once the SPIxBUF register is read by the user code, the hardware clears the SPIRBF bit. 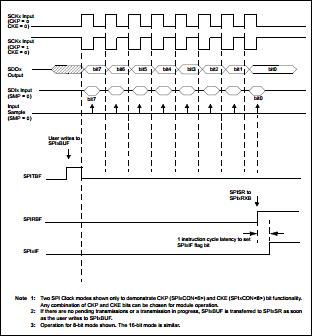 If the SPIRBF bit is set (receive buffer isfull) when the SPI module needs to transfer data from SPIxSR to SPIxRXB, the module will set the SPIROV (SPIxSTAT<6>) bit, indicating an overflow condition. Data to be transmitted can be written to SPIxBUF by the user software at any time as long as the SPITBF (SPIxSTAT<1>) bit is clear. The write can occur while SPIxSR is shifting out the previously written data, allowing continuous transmission.